Here is a listing of the tracks available on this German CD. Some of them are also found on the BBC very best of CDs, but as a different recording. Auf der strasse nach St. Petersburg. A fun romp. , Na sdarowje (Cheers!). He's mixing languages here just to confuse me. Teure Heimat (Va Pensiero). From "Nabucco" by Verdi. Am brunnen vor dem tore. A slow song. Die Moldau (The Danube). He really is keen about rivers! Die Trommel. A military theme. Am Don, am stillen Don. Another sombre tale of a river. Die glocke von St. Dimitri. A rolling song, with some lovely low notes. Des teufels don kosaken. A faster song, with a swing rhythm. Das schicksal ist so wie der wind. A song about family. Der bär und die lerche. The bassoon gives this a quaint feel. Grosser alter Don*. Yup, he really likes rivers in song titles. Stenka rasin. A sweeping song. Nobody knows the trouble I've seen. American spiritual, sung unaccompanied. Die legende von den 12 räubern. Slow song which includes high and low notes. Zwei gitarren (Two guitars). Includes spanish guitars and some reflective singing. Im teifen keller. Drunken laughter going up and down the scale (73K), ending on a low note. * = Also available on the two "Very best of" CDs (different recordings). This double compact disk is © 1994 BMG Ariola Miller Gbmh. Bar code 74321-19246 2. Information reproduced for review purposes. Please note that I am just a fan and not in any way related to Elisar Records or any company that supplies his records. 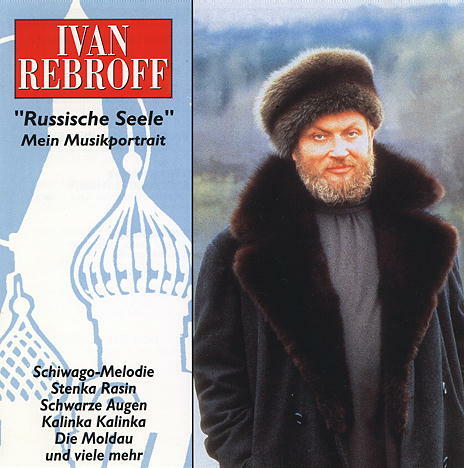 Please contact your local record store or Elisar Records if you wish to buy Ivan Rebroff's CDs. Copyright © 1996, 2005 Carl Muller (carlmuller@hotmail.com). All Rights Reserved.